The city was founded in 1201 by the Bishop of Bremen, Albert Buxgevden. Riga is the capital of Latvia and the largest city in the Baltic States. 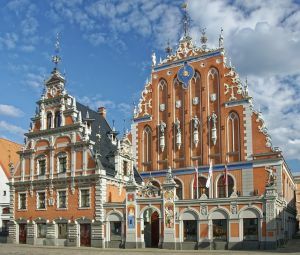 The historical center of Riga is located close to the Daugava River, and the northern areas extend to the Gulf of Riga. To Riga it is good to run away from weariness, spleen, hassle and gray everyday life. The small and cozy streets of the Old Town give a fabulous mood and the perception that you are really in a very old place. Riga is divided into two parts by the river Daugava, through which several beautiful bridges are transferred. The old city "dwells" on the right bank, it is quite small and very cozy. Riga speaks both Latvian and Russian, many speak English well. Town Hall Square is perhaps one of the main squares of the capital of Latvia. It is on this square that the Ronald statue, the House of the Blackheads and the Town Hall building are located. Riga Town Hall Square, Riga is very fond of Christmas and New Year, so the Christmas tree is even in the hands of the statue of Roland. The square itself with all its appearance shows all the originality and beauty of architecture. Travelers should definitely visit this amazing place. The center is played by musicians performing folk tunes. In the 3D cinema you can go on a virtual tour of the whole of Riga. And you can just eat ice cream on the bench, enjoying the view of the house of the Blackheads and the unforgettable spiers of the cathedrals. At the corner of the square are souvenir shops with a huge selection of products made of amber. St. Peter’s Church is not only one of the main attractions of the Latvian capital, but also a unique symbol of Riga. Perhaps the most remarkable place in Riga is the observation deck under the dome of St. Peter’s Church. There are always a lot of people here, but it doesn’t bother much. And the views of evening Riga from the observation platform are stunning. In the cathedral there is a magnificent acoustics, various concerts are held there. In this church, a stunning spirit - there is a very strong energy place. The first mention of this temple goes back centuries, namely the beginning of the XII century. The church tower is 124 meters high, and half of this height is a spire. Basically this church is famous for this spire. At a height of 57 meters there is the first observation deck, and at a height of 71 meters - the second, to which tourists get an elevator. From these viewing platforms there is an amazing view not only of old Riga, but also of the whole city. This temple is a state monument of architecture, church services are held here, exhibitions are organized and concerts are organized. The Dome Cathedral is located in the central part of Old Riga, and to the Dome Square, located next to it, a lot of narrow streets of the old city flow down, in the summer street cafes and various events are held here. 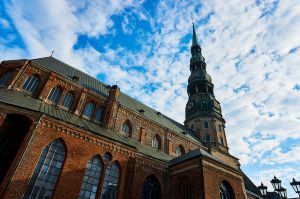 The architectural ensemble includes not only the majestic cathedral where the organ sounds and services are held to this day, but also the monastery where the museum is located now - the History of Riga, which is perhaps the most interesting museum in the Latvian capital. In the same building you can visit the museum of navigation. The courtyard of the cathedral has the form of an open vaulted gallery. Tourists traveling in Riga should definitely look at the famous 14th century architectural monument - the House of Blackheads. 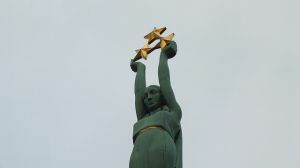 This monument is located in the heart of the Latvian capital. For several centuries, this house was rebuilt several times, but during the 2nd World War it was almost completely destroyed, and only in modern times was this castle successfully reconstructed. Being in the area of ​​old Riga and walking along Malaya Zamkovaya Street, the traveler should pay attention to the houses with numbers 17, 19 and 21, these buildings are a rather interesting architectural complex called “Three Brothers”, by analogy with the “Three Sisters”, that in Tallinn. These structures, which are tightly pressed against each other, are an excellent example of medieval urban development. Such a building is typical for the bulk of European cities. This ensemble is also interesting because houses are built in it at different times, therefore the presence of different architectural styles is noticeable - Dutch mannerism, baroque, renaissance and gothic. 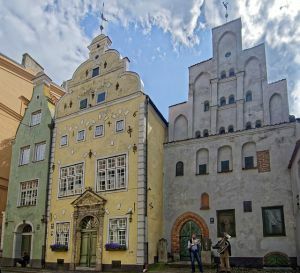 Old Riga is a very compact city, but walking through it you can meet the masterpieces of the Middle Ages at every turn. Among these magnificent monuments of architecture there are two main historical sites of the city, the Great Guild and the Small Guild. In Old Riga, on the Tornja Street, there are the Swedish Gate known to all travelers, which is an invaluable historical and cultural monument of Latvian architecture. Riga is different. Places you can see the once other people's buildings with their own features and styles. However, today everything has taken root here, even the fact that they wanted to be torn down at different times. Approximately the same fate awaited the Swedish Gate. But, the landmark was decided to leave and restore. 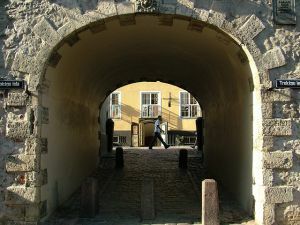 In modern times, the gate is a reminder of the Swedish era in urban history, as well as a place fanned by urban legends. Riga is the unique charm of the Old Town: narrow streets and ancient buildings with tiled roofs, leisurely walks, bridges over the Daugava River, and organ music in the famous Dome Cathedral. There is another attraction here, which has become a kind of hallmark of this amazing place - the House with black cats (CatHouse), built at the beginning of the 20th century and attracting many tourists. 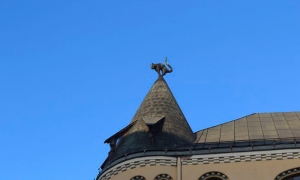 With the appearance on the roof of the building of these animals is associated one of the famous urban legends. Today, the Freedom Monument is the highest monument of this type in Europe. In 2001 it was completely reconstructed, and it again began to shine in the middle of the Latvian capital. The square, with this landmark of the country and the city, retains its symbolic significance and along with it serves as a favorite place for friendly walks and dates among the local youth. Every day at the Monument of Freedom from 09.00 to 20.00 there is a guard. In the history of Latvia, the Monument of Freedom is set aside a separate place. 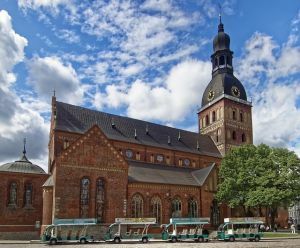 Of course, Riga is famous for its Old Town, but in Riga there are many other and interesting places, monuments and sights. Going to the capital of Latvia, during the Christmas holidays, the traveler can not only see the local sights, but also become a witness of a unique festival, which takes place exclusively in Riga. 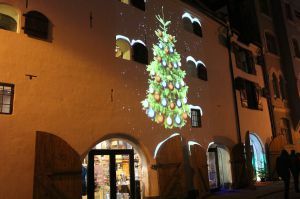 The festival "The Path of Christmas Trees" has become a new good tradition since 2010 and has already won many fans, both among the townspeople and among the many guests of the city. The uniqueness of the festival is also in the fact that all the exhibits are not located in the museum premises, but under the open sky and anyone can look at these works of art. Souvenirs, what to bring from Riga? Tourists who have visited Riga traditionally bring amber jewelry, linen tablecloths, ceramics and, of course, the well-known Riga Balsam as a souvenir of the trip. But this is not the whole list of traditional Riga souvenirs. From Riga, travelers are taking casts from the famous Riga facades and various unusual decorations. These decorations include products made of amber green, as they say this marsh amber. In the souvenir shops you can buy leather covers, high-quality notebooks and leather wallets, as well as rather original wooden dishes made by hand by Riga artisans. They bring the original Riga balsam, made with a deviation from the classic recipe - with black currants. You can bring a very high quality natural weighed out soap from Riga soap factory: “Apple with oatmeal”, “Strawberry with cream” and others from a huge selection. There are many different places in Riga where travelers with any taste and predilections can find comfort. There are stylized restaurants under the Middle Ages, many bars where you can offer all sorts of drinks. In the center there are many cafes, there is a fast food establishment. 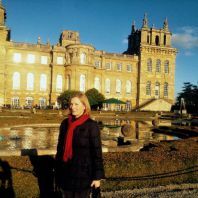 Choose a guide, pick up an interesting excursion and read reviews from other travelers on this page. Riga is a big city, so the choice of a hotel or other place to stay should be built on the principle of how it will be more convenient. If you want to get cheap accommodation and the distance to the center is not important for you, then on the outskirts you can find cheap hotels with quite decent service. If you want, after leaving the hotel, to be in the "old city", then the cost of such accommodation will be much higher. 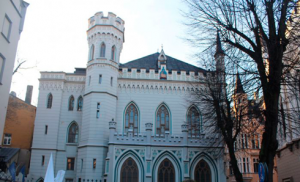 But for those who want to save money and live as close as possible to the "old town", there is a great alternative to living in a hostel, where such a disadvantage as having roommates is more than covered by the advantage of living in the heart of Riga. In the evening Riga becomes empty. When it gets dark, it is good to go to the most probably high bar of Riga - located in the Radisson Blu hotel, where from the height of the twenty-sixth floor you can admire the night city, decorated with a scattering of multicolored lights. Cocktails in the bar are quite expensive, but the stunning view from the window is worth it to come here. You can select a hotel, find out about its reviews and make a reservation through the international system by clicking on the link below. The population of 695,539 people as of 2013. The climate is temperate continental. Summer is warm and humid. Riga Airport is located 13 kilometers from the city center. The railway station is the most important transport hub of the city of Riga. Closely established transport links between the countries of the European Union and Russia. In addition to freight traffic, the Freeport of Riga is also involved in passenger transportation. There are cruise lines, as well as ferry communication with other EU countries and Russia. Very cozy and small streets of the old city, I want to go back there again!